The "4th trimester" is a sacred and often neglected time in a woman's cycle of pregnancy and birth. While it is not a medical term, the 4th trimester is commonly described as the first three months after childbirth. It is a time of tremendous upheaval and adjustment for both mother and baby, and a common sentiment among postpartum women is that during this time it is very difficult to find time for self care (for obvious reasons!). There's a saying in yoga that the best time to relax and meditate is when you are too busy to do it. Never is this more true than during the 4th trimester! I believe that creating space for self care after childbirth is crucial to recovering both physically and spiritually. Since yoga challenges played a big role in motivating me to spend time on my mat during pregnancy, I decided to create a 4th Trimester Yoga Challenge on Instagram to encourage new mamas and mamas-to-be to carve out space and time to take care of themselves. My co-host for the challenge is a yoga mom named Claire who lives on the other side of the world in the Philippines. She has a beautiful yoga practice and an even more beautiful heart. We connected on Instagram during our pregnancies. When I was having a difficult time recovering after my csection, she once dedicated a sunrise to me in hopes it would lift my spirits (and it truly did!). Together Claire and I will present a daily challenge pose that is meant to alleviate common ailments of the 4th trimester such as neck and shoulder stiffness, weakened core muscles, and an aching back. Because Claire had an uncomplicated vaginal birth and I had an emergency cesarean birth (and I also have diastasis recti), we will offer a variety of pose modifications for mamas to choose from as they participate in the challenge. The contest is being sponsored by an inspirational young woman, Amelia, who recently lost her firstborn son, Landon, just four days after he was born due to complications during labor. 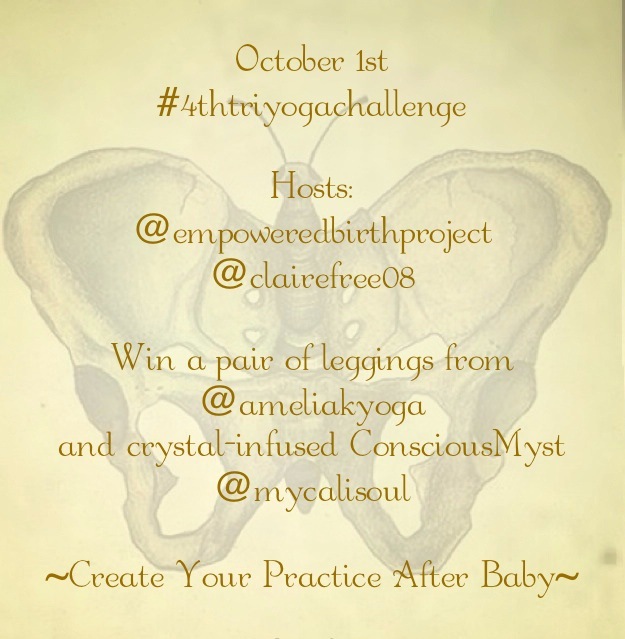 She has donated as a beautiful pair of yoga leggings from her latest line of yoga apparel, Prana Vida Style, to be given to the winner of the challenge. Amelia and I also connected during our pregnancies, and her willingness to share her grieving process with the world through social media has been a source of comfort and healing to me after my son's traumatic birth. Finally, my dear friend Ileah is also sponsoring the challenge and has donated three bottles of her crystal-infused ConsciousMyst body spray-- Spirit, Warrior, and Beauty. Ileah and I met several years ago through mutual friends. We didn't see each other much until we suddenly found ourselves pregnant at the same time and needing support in the vast metropolis of Los Angeles. Our friendship grew and blossomed along with our bellies. She too underwent an emergency cesarean delivery. You can keep tabs on this challenge here, on my Instagram page, and on Facebook as well! Please spread the word to anyone who know who could use a little extra self care in their daily lives. I am honored to share this space with you as we heal, nurture, and recreate ourselves after childbirth.